Ready for a vehicle upgrade? Whether you’re looking to buy your first car or begin a new lease, East Coast Toyota’s knowledgeable sales staff is eager to help you find a car that falls within your specified budget and needs. 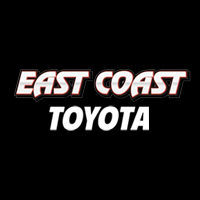 East Coast Toyota has hundreds of new Toyotas for sale, from 2017 to the latest 2019 models. With most models featuring a selling price lower than the MSRP, finding a perfect match is an affordable, hassle-free experience. To take advantage of our special internet discounts, please take a screenshot or print page and present it to your salesperson. Call us for the best deals on the internet. New vehicle pricing includes all offers and incentives. Tax, Title, Tags and $499.81 Dealer doc fee not included in vehicle prices shown and must be paid by the purchaser. While great effort is made to ensure the accuracy of the information on this site, errors do occur so please verify information with a customer service rep. This is easily done by calling us at 877-247-5875 or by visiting us at the dealership.